Choosing the right supplement to support your body is an important part of any bodybuilding effort. With a good multivitamin supplement, you can make sure that your body gets all the nutrients needed to be healthy and strong. A good multivitamin supplement that is enriched with the right ingredients can also boost your stamina and performance so that you can work out better. Below, we will discuss about the comparisons between two popular men’s multivitamins on the market, Opti Men vs One A Day. Which one is better for your body and for the money? First of all, let’s start from the most important aspect of any supplement, which is the formula. We need to know for sure what the product contains in order to determine the quality and suitability to our body. The Opti Men supplement is described as a high-potency multivitamin for active men, featuring more than 75 ingredients in four special blends to provide the important vitamins, minerals, and amino acids. The Amino Men Blend provides several types of amino acids that are essential for building and repairing muscle tissue. The Phyto Men Blend comes with various anti-oxidant ingredients. The Viri Men Blend features natural extracts that are known to boost stamina and power, such as panax ginseng and ginkgo biloba. Finally, the Enzyme Blend has a few types of enzymes that will optimize the digestion process. On the other hand, the One A Day supplement is quite simpler. It only has various types of vitamins and minerals, such as vitamins A, C, D, E, K, Bs, calcium, iron, magnesium. It does not have any special blend to provide antioxidants, amino acids, or enzymes, except for the lycopene content which is a cell-protecting anti-oxidant agent. 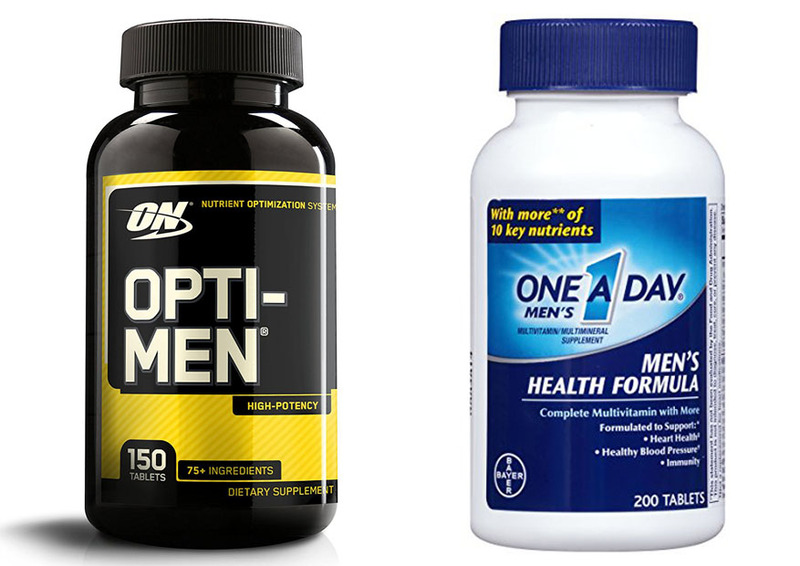 The next difference between Opti Men vs One A Day that you may want to consider is the consumption dosage. One A Day is indeed more practical and convenient to consume. It only requires you to take one capsule per day. For someone with a very busy schedule, consuming a supplement that requires you to take multiple pills at different times in the day is very tedious. If this is the case, One A Day makes a viable alternative. However, you will not get so much of a power/stamina boost, as the supplement simply provides vitamins and minerals to nourish the body. With Opti Men, you can expect to get boosted power and stamina due to the additional blends. Besides, most of the vitamin and mineral levels are also higher. So, this supplement is more potent. But it requires you to take three tablets with food daily. In general, Opti Men is more recommended. It is a more potent supplement that can give you more vitamins and minerals. In addition, it is enriched with four blends that can strengthen your body and boost your performance. However, if you are a very busy person and you prefer to take just one pill daily, One A Day can be the alternative.